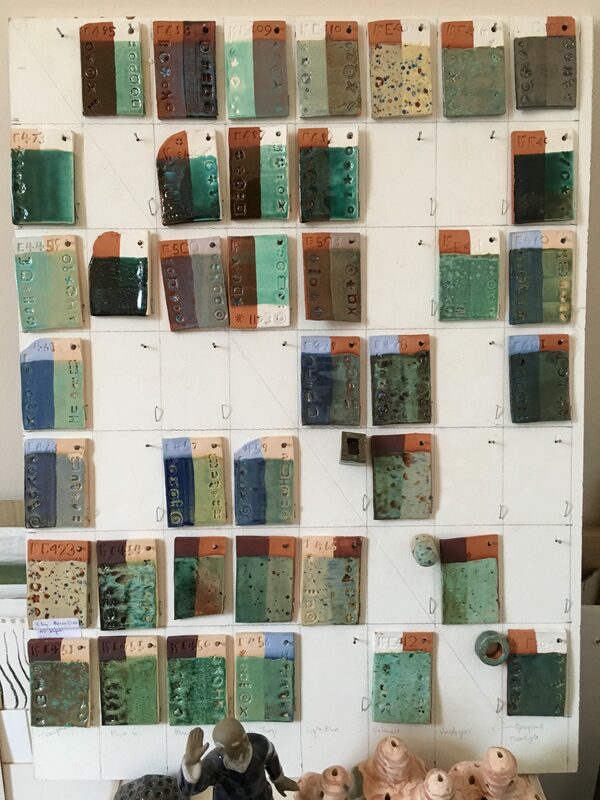 This is my glaze combining matrix (below). I use this in combination with written records to work out colouring schemes for my ceramic work. 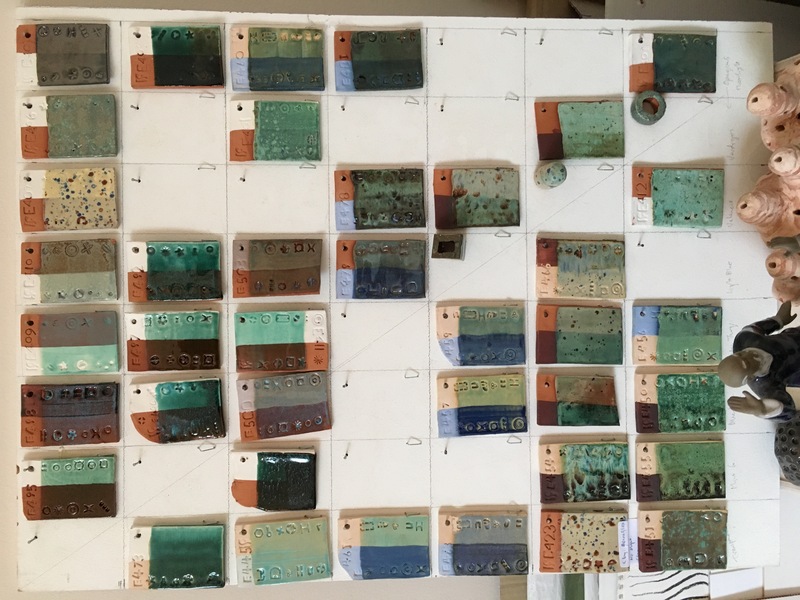 All potters have to do something like this, testing their glazes on their clays to work out how all these materials will look once they are combined and fired. I use a couple of different clays. I colour them with about half a dozen different slips (paint made from clay applied during the drying period) and now I have about ten different glazes to play with too. I am not sure how many possibilities that makes but I know it’s a lot more than will fit on this board. I will try and explain what is shown here. The top line of terra-cotta tiles and the line on the left edge of buff clay are tiles with a single glaze applied. All the tiles beyond those two lines have a combination of the glaze vertically above and the glaze on the left edge. Really, the diagonal line starting at the top left should all be blanks, but I have filled them in with variations I think are interesting. So that’s my matrix, any questions? I know I will need more time and space for this aspect of the work for certain, but at least I have re-opened the door on glazing again. The point of all this is to reduce the risk of spoiling the work when it is glazed. But it remains a high risk process where things do not always turn out as you planned them. Sometimes I have a vision of how my work should be finished, other times I have to work something out. It has become clear that leaving the work unglazed is no longer satisfying so I have moved back into the risky business of glazing. The possibilities are (almost) endless – as is the amount of work.